Our 1968 John Deere Combine is a true piece of farm history. The 1968 John Deere was the largest combine of its day, with an engine comparable to the popular muscle cars of the period. Farming has changed dramatically since then, and today the smallest combine John Deere makes is twice the size of this one. In its working days, this combine harvested 10,000 acres of corn, 4,000 acres of soybeans, 2,000 acres of wheat, and 1,000 acres of oats. Now it is enjoying retirement at Ramseyer Farms, where it gets to play all day, allowing the imagination of little farmers to run wild. 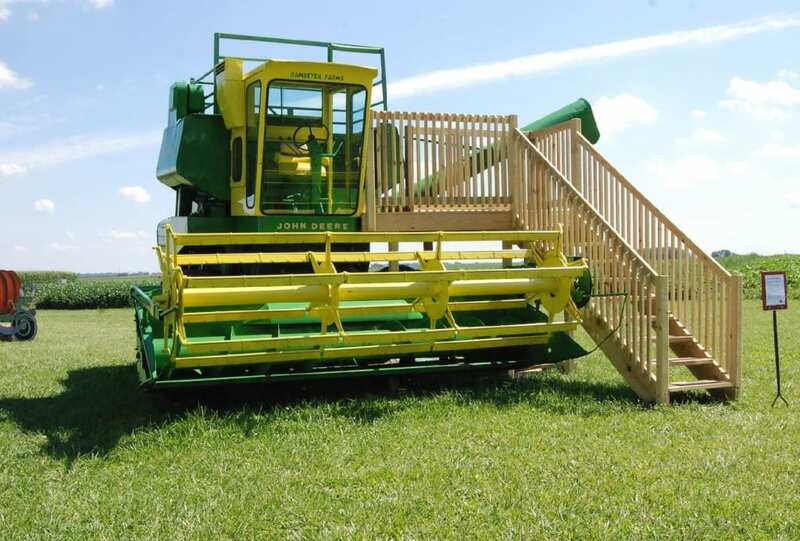 This combine is both a piece of history and play equipment. Visitors of all ages can climb up to sit in the seat, pretending to drive, or slide down the hopper like an ear of corn! Ramseyer Farms is proud of our history as a family farm, and we are proud of the history of farming. We invite you and your family to join us for a fun and educational farm visit.